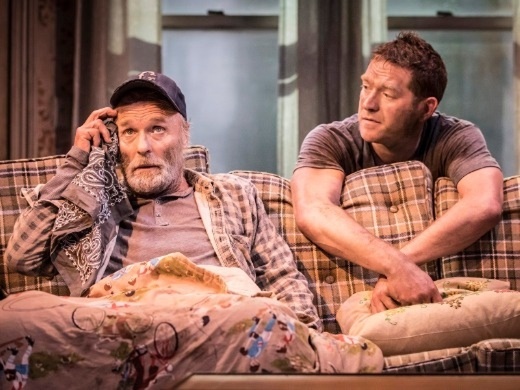 Five-time Golden Globe winner Ed Harris (The Truman Show, Pollock) makes his West End debut in Pulitzer Prize-winning play Buried Child. Husband and wife Dodge (Harris) and Halie are struggling to hold on to their farmland when their grandson Vince arrives. Apparently unrecognisable to his family, Vince navigates a domestic life that is coming apart at the seams as his relatives gingerly edge around a long-held secret. Gritty, captivating and dazzlingly funny, Sam Shepard’s (True West, Bloodline) Buried Child takes a dark look at the disenfranchised America of 1979 as recession and political discord take hold. Almost forty years after its first performance, the parallels with our own time are clear and our delusions about our family lives as tenacious as ever. This highly-anticipated transfer of the critically-acclaimed Broadway production also stars fellow Golden Globe winner Amy Madigan (Gone Baby Gone, Field of Dreams) as Halie and features the creative team behind the sell-out Broadway transfer of Jesse Eisenberg’s The Spoils. 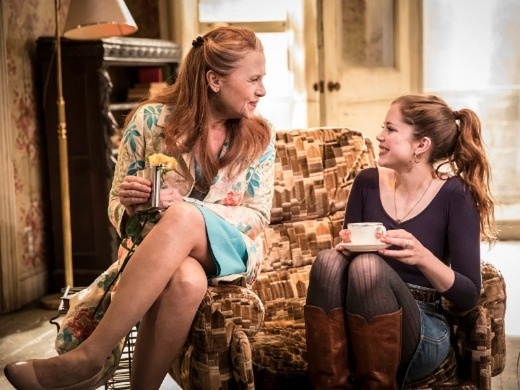 A classic domestic drama that invokes the Gothic, the mythic and the macabre, Buried Child is an American masterpiece that is rarely seen on the London stage. Playing at the Trafalgar Studios for a limited time, book your tickets today! Ed Harris is a five time Oscar Nominee and Golden Globe winner. A giant of the America film industry and recipient of a star on the Hollywood Walk of Fame. Harris’s film credits include; Apollo 13, The Rock, The Truman Show, The Hours and Pollock. He also won a Golden Globe Award for playing Senator John McCain in Game Change. This autumn, Harris will star in the premier of HBO’s sci-fi drama Westworld. Joining Harris is Golden Globe winner and Emmy nominated Amy Madigan. *The appearance of any particular artist cannot be guaranteed. If in doubt please check with the Box Office before booking. Walked out at half time, irritated by Amy Madigan's grating voice. It wasn't funny, tragic, compelling or superb and, quite frankly, I was bored. Could do better! Sorry. I'm sorry to say that I did not enjoy this at all. I found it miserable and boring. Maybe it was because my sister had asked to see it as a birthday present for her. It's not the usual thing that I would go to see. I like a happy ending. I like to come out and feel that my heart has been lifted, even if it has been sad, there is usually a moral to the story that makes you feel better. This was just pure misery, although the acting was good. Absolutely brilliant. Ed Harris amazing, in character before the play even started! Fantastic performances all round. There are times, particularly act I (of III), when the pace is slow and overly portentous, but this is forgotten in the face of such amazing acting in total, but particularly Ed Harris (who never leaves the stage). It is hard to ever take your eyes off Harris who is utterly compelling and ultimately completely sympathetic. There is a way in which the ultimate reveal doesn't quite equate to the disturbing level implied. Overall though, I simply loved watching these actors, particularly Harris and Madigan, at the top of their game. A serious subject but with many amusing moments. Ed Harris was amazing! This production is a slow burner that packs a devastating punch. Ed Harris gives an unforgettable performance. Beautifully staged - so intimate you are part of this broken family. The dialogue has humour but the despair of no hope shines through. Special applause to the young girl who accidentally visits. I thought Ed Harris was spectacular but I found the first at quite tedious. It took some of the actors quite some time to find their characters but by the second act I was deep into it and by the third act I was really intrigued. It was our sons first west end play, they were enthralled, we all enjoyed the play immensley, great evening out, highly recommend. Ed Harris is amazing in this play which resonates especially powerfully at the moment given the current state of American politics. It is good to see a play about the American experience not centred on New York or California but expresses those often unheard voices of the middle of nowhere or as Dodge put it- the boondocks. strongly recommended; Ed Harris is very good in it. Vincent character also played very well. I had good time. Whilst production was excellent as was Ed Harris, I found the storyline slow, disjointed and in places lacking credulity. Characters were given insufficient opportunity to evolve or be developed and opportunities for for deeper humanist understanding where missed. Very slow and uninspiring. The play was very well acted. Ed Harris a very professional actor. Bit stingy with the prosecco. Great show. Ed Harriswas mesmerising. Thoroughly enjoyed Buried Child. Acting excellent - quite different - a real treat. Divided into three acts (and two intervals) this play was a slow burner, which started off slowly and built to a jaw-dropping crescendo. Excellent acting all round including very strong performances from the two leads. The theme of the American dream gone wrong is one we see in many dramas, but this one was reinforced by its powerful imagery and carefully placed words which left you with a lot to mull over at the end. Recommended. Ed HArris was riveting and the rest of the cast was great too! Don't miss this play or you will miss one of London's truly great actors on stage. Fantastic revival of a dark but riveting play Thank you Sam! There was no performance on Mon 26th. Excellent acting by a talented cast. This is one family you wouldn't want round for Christmas dinner! The play skated round Tennessee Williams themes and the performance were universally excellent with Harris and Madagan particularly good on stage. There was a general unease which crept though the second act as the play hurtled towards its shocking conclusion and at 3h hours long with 2 x 10 min breaks, it went surprisingly quickly. The problem was the theatre who have, in an effort to squeeze in extra seats sacrificed any kind of comfort, something very much needed for a play of this length. See review of seats below. Great acting by Ed Harris, his wife and the young lady! Can't figure out the play though... Thought it was just me who couldn't figure it out but none of the people we were sitting around really understood the relationships properly... the writer could have left more clues... makes you feel stupid for not being able to figure it out better! Good play. Excellent acting. Families have secrets. Families are dsyfunctional. Reminded me of home and lots of the word were familiar. A bit slow to begin with, but it soon became very engaging with an ending that will always stick in my mind. A very good production with excellent portrayals from all characters with Ed Harris proving what a masterful actor he is. It's very dark showing such a tortured family - although with some humourous lines. Hadn't realised it was from the 1970s. Terrific set - although "props" had their work cut out! I can see why the play won the Pulitzer Price. Excellent inside of the real American tragedy with a fantastic cast. Ed Harris acting just blew my mind. I have no words to express how fabulous this experience was. Probably the best play I’ve seen so far in the theatres. Excellent. Dark as treacle. Really enjoyed it. Ed Harris and Amy Madigan were suberb. Excellent! The cast were fabulous as was the production itself. As dark and miserable as the scene was there were still some lighthearted, very human moments that made it a delight to watch. Ed Harris was definitely the highlight, though not overshadowing the rest of the actors. Fantastic play. an emotional ride with a dysfunctional family with a twinge of horror. All mixed with humour and outstanding performance from Ed Harris. Excellent service from The Box office. Great ticket price with no hassles. Amazing. Beautifully written, thought provoking. The acting was extremely good. Ed Harris is captivating as you would expect,as was Amy Madigan, two of our best character actors I would say, the whole supporting cast was at the very top of their game also, the play is dark and sinister but carries the audience through the story from beginning to end, be aware the show will run for nearly three hours with two short intermissions but it certainly doesn't seem 'long' a very enjoyable piece of work in my opinion. Pacing too slow Dialogue too low. As this play is dialogue driven it's imperative the dialogue be heard. I am NOT hearing impaired, but there were times when some of the actors's were hardly audible. The pace of the production was far too slow making it a dirge to sit through; apart from Ed Harris, there was much unconvincing TV- acting. A good play in a mediocre production. 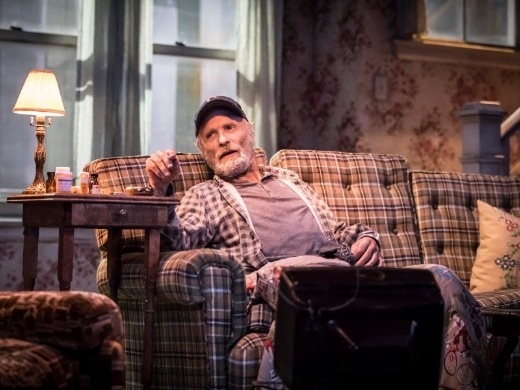 This is a dystopian play about the death of the American Dream, both moving and depressing with a bitter wit and superlatively acted esp by Ed Harris as the father Dodge, but all the cast were excellent. For me the most moving part was Dodge's loving enumeration of all he had 'before'. We loved this play! The fact that Ed Harris was already on stage and in character as the audience were taking their seats was just so unusual and very amusing. Each cast member was riveting. We would thoroughly recommend this. This was the best play we've seen for years: true to the text, with unaffected and consistently true performances from the cast - there wasn't a weak link. 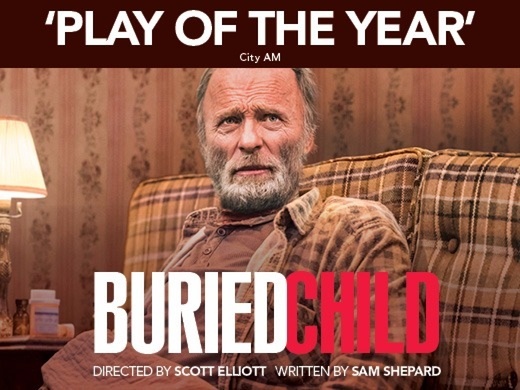 All those critics who give mediocre productions 4 or 5 stars should come to see 'Buried Child', to remind themselves of what great theatre looks like.
" [Ed Harris] he's captivating; the sort of contained cinematic performance that pulls an audience in close." 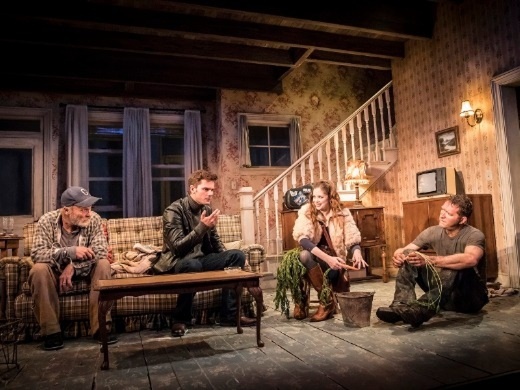 "Atmospheric and meticulously performed revival of Sam Shepard’s strange American fable"
"Buried child speaks to all of our fears, our despairs, our grief. Amongst an excellent cast, Ed Harris’ performance stands out as American Theatre’s King Lear, and Amy Madigan gives a chilling performance that will haunt theatre for a generation."